The Supreme Court's Citizens United decision unleashed unlimited anonymous spending on campaigns. Over $475 million was spent on CA ballot measures in 2012 alone, almost all of it by veiled actors hiding behind innocuous-sounding names like "Stop Special Interest Money Now" or the "2012 Auto Insurance Discounts Act". Government-changing propositions are passed by hidden special interests spending millions on deceptive ads. 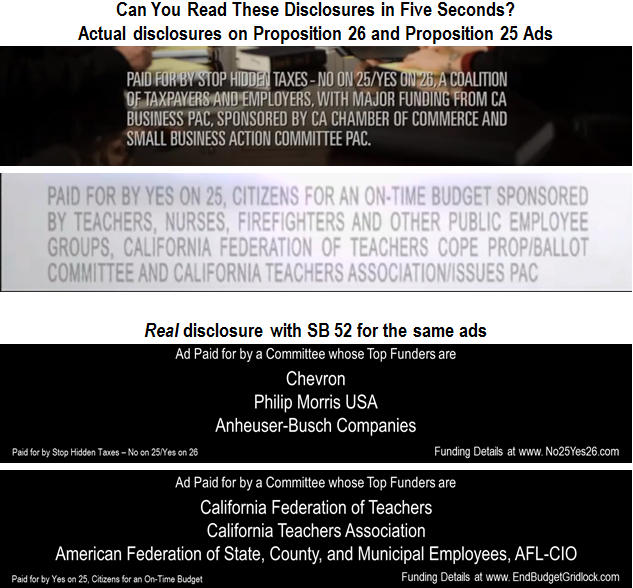 SB 52, the California DISCLOSE Act, would end big secret spending on campaigns by letting voters know who REALLY is paying for political ads — on the ads themselves. Authored by Senators Mark Leno and Jerry Hill and sponsored by the California Clean Money Campaign, SB 52 would amend the Political Reform Act of 1974. SB 52 had a historic victory for transparency when it passed the Senate floor on May 30th on a 28-11 vote with bipartisan support. It is now in the State Assembly. Requires the three largest funders of political ads to be clearly identified for five seconds at the beginning of the ads, so voters know who is actually paying for them. Applies to all television ads, radio ads, print ads, mass mailers, online ads, billboards, and websites for or against state and local ballot measures, to third party ads for and against state and local candidates, and to issue advocacy advertisements. It applies whether ads are paid for by corporations, unions, or millionaires. Tells voters where to find the details — Requires ads to list a website that prominently lists the ten largest funders and a link to all funders of $10,000 or more (for state races). Proposed Follow-the-Money Disclosure will require organizations that spend or transfer politically-available funds to report the actual original corporate, union, or individual contributors — not misleading committee and non-profit names. Would your group like a speaker or to endorse? The attempt by Texas oil interests to overturn California's landmark climate change law with Prop 23 in 2010 failed because opponents had enough funds to disclose to voters that it was funded by Texas oil companies. Despite tens of millions spent in 2010 on Props 16 and 17 by PG&E and Mercury Insurance, both lost because enough people knew they were the largest spenders and took that into account when viewing their ads. Unfortunately, the largest funders aren't usually as clear as in Props 16, 17, and 23. SB 52 would make sure they're clear all the time. 8 out of 9 justices in the Supreme Court's Citizens United decision noted the problems when groups run ads "while hiding behind dubious and misleading names" and said we need transparent disclosure for voters "to make informed decisions and give proper weight to different speakers and messages." Required TV ad disclosures are the same time and space as current law — just much more effective. Required radio ad disclosures are shorter than those in current law in most cases — but more effective. "The California DISCLOSE Act, SB 52, stands on a firm constitutional bedrock and is worthy of support." See our full comparison to current disclosure law to see how SB 52 is both reasonable and effective. "Requiring people to stand up in public for their political acts fosters civic courage, without which democracy is doomed." 84% of California voters said they favored legislation to "increase the public disclosure requirements of initiative sponsors to more clearly identify who are its major funders" in the October 13, 2011 Field Poll, including 86% of Democrats, 88% of Independents, and 78% of Republicans. Over 100,000 Californians have signed petitions urging the legislature to pass the California DISCLOSE Act. "The overwhelming power of money to mislead voters is a profound moral issue." — Reverend Dr. Rick Schlosser, Executive Director of California Church IMPACT, representing 1.5 million people of faith in California. Tell voters who is really funding propositions and attack ads when it counts!